Micro moment monitor manages massive months! Once upon a time there was an application called SmallTime, which sprouted from the programming hands of James Freeman. That application, however, has never been updated to run on 32-bit hardware such as the Iyonix, let alone modern ARMv7-based platforms. Aemulor can save the day, but that’s hardly ideal, and the licence under which SmallTime was released meant newer versions updated by third parties couldn’t be distributed. Fred Graute therefore took SmallTime as his inspiration, and developed a completely new application that achieved the same goal, but which would work on newer hardware – and in February 2015, version 1.00 of MiniTime was released under the three clause BSD licence. There were a small number of updates made to the software over the course of a few months, which brought it up to 1.03 released in May of the same year1. Those updates included the addition of a comprehensive range of options, making the application highly configurable – from simple and obvious things like the format of the time and date, the user also has control over the colours used for the display, the position of the clock on the screen, and even where it sits in the window stack. Last week, Fred released version 1.04 of the application – the headline feature of which was the addition of a simple calendar, which is opened by clicking on the MiniTime clock display with the Adjust mouse button. 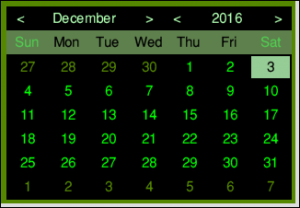 Given the existing configurability of the application, it’s no surprise that there is a wide range of options for the calendar itself – including whether it is transient (after opening it, clicking anywhere on the screen other than on itself or MiniTime’s clock will close it) or persistent (it remains open until actively closed with another Adjust click). Additional features include the ability to ‘export’ any date in the calendar to the global clipboard with a Ctrl-click, or to insert them in at the cursor in another application with a Shift-click. However, until now it has never seen a mention on RISCOSitory. This is because Fred is suffering from what I’m now going to start calling WROCC syndrome2, and doesn’t send announcements to news@riscository.com – an email address designed to ensure I see such announcements, which may not happen if I’m left to discover them on forums and mailing lists that I may not read or, if I do, may not read them in a timely manner3. I’m calling it that because, while neither Fred nor the Wakefield RISC OS Computer Club are the only ones to do it – or, rather, not do it – it was spotting a WROCC announcement at the last minute and not seeing another at all until it was too late that has prompted me to make a point about it, so they get the dubious honour of having it named after them. Of course, often being very busy, even if announcements do come my way, I may not be able to report on them in a timely manner – but I do try, and the recently introduced news nybble format has improved that situation a great deal. But only when I know about the announcement in order to report on it in the first place.